Thank you so much to everyone that sent in birthday wishes yesterday, both through the blog and through email. I’ve said it before and I’ll say it again: You all are the very best! So it seems most appropriate that I return the kindness. How about an update, eh? You’ll note I’m leaving the word “book” out above. This isn’t just a “book update.” Things are progressing on a number of fronts now. Believe me, we’re taking every imaginable advantage of the recent delay to create thing(s) like no one has before. Take, for example, our long-established goal of providing “multimedia” material. That’s been one of the toughest nuts to crack, conceptually speaking. The rub? To maintain relevance within the confines of our overall approach, a documentary piece should be both procedural and analytical in nature. That’s great, but two risks arise: 1) We’d end up presenting material completely redundant to the book’s, thus negating the documentary’s reason to exist… or 2) If we specifically left material out of the book so that it would be unique to a documentary piece, we’d end up with a purposefully-incomplete book hardly fitting the comprehensive mold we’ve always envisioned. We could always just plop ourselves in front of a camera and give you a 10 minute fireside chat, allowing audiences to put faces with the music and book, but that’s fluffy and insubstantial… and I can’t seen publishers being very happy about having to author and package a DVD that’s as useless as that. So what happens? Should this “multimedia” idea be scrapped? No, not at all. We know that people respond to the personal side of things; we’ve seen it repeatedly in speaking engagements. And I think it’s important to show people that, look, all this music was created by a very real person. We headed into last week knowing this—knowing that there was something of worth to be created, but unsure of what our angle should be. A camera was set, we arranged a makeshift set, stashed away a few Altoids (talking heads are much closer in real life than they appear to be on camera! ), and sat down to… just do some general work. It seemed the easiest way to find a piece was to let it find us. We had plenty of other work to tend to, so why not simply introduce the camera to the room. We started with a few book notes. As the text has moved from liners to full-fledged book, it’s become increasingly analytical. This means that there’s been more back-and-forth between Shore and me so that I can be certain I’m presenting his concepts as he imagined them. Example… I referred to recurring G-minor and E-minor chords as being a sixth apart. Howard actually thought of them as being a third apart. Same concept, different terminology, but it’s important to me that my language reflects his mind. The book review only lasted a little while. We’d planned on managing the bulk of it the next day anyway. The Rarities were next on the docket. This was incredibly exciting for me. I’ve been rummaging through archives for nearly two years now, and though we’ve always discussed the findings, this was the first time we’d sit and listen through the music together. And a funny thing happened here. In the process of reviewing this material I think we found our multimedia piece. Talking about the Rarities with Howard was incredibly interesting. 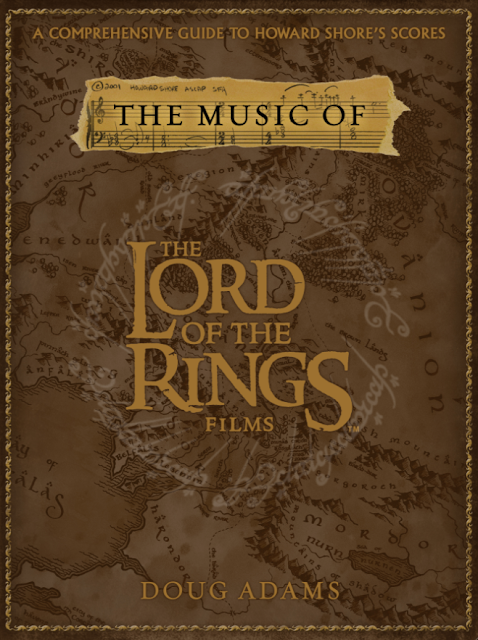 Even though the conversation was ostensibly about a single topic, it proved a revealing way to touch on a number of subjects: the history of the project as a whole; Shore’s creative process, the collaboration with Peter, Fran and Philippa; alternate edits of the film; alternate musical concepts… we even found the very first mock-up Shore created for LOTR. Yes, the very first music he wrote for this project. I suppose I should have known it would pan out this way. In order to discuss the unused music in the Rarities, we’d have to discuss the process at its deepest level. It’s the perfect device for these types of conversations. And suddenly, everything clicked. 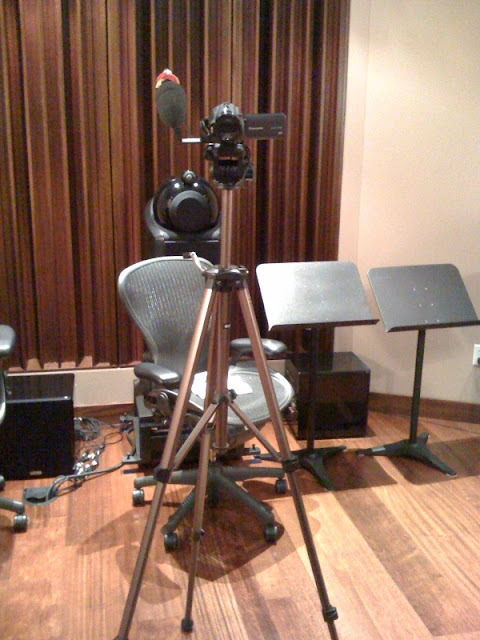 By the next morning we were no longer just talking with a camera in the room, we were crafting a very specific piece. It would be something entirely different, something that, as far as I’m aware, no one has really tried before. Now, don’t think I’ve gone senile in my newly advanced age! I’m not giving everything away here. Our plans for this video material are, as I say, anything but straightforward. I’m not yet ready reveal how exactly this will all be assembled. If current plans are realized, it’ll be very unique, very accessible, and (with a little luck) incredibly immersive. So within the next few weeks I should be getting my first glimpse of the footage from last week. We’re also very close to re-locking the book text with HS’ edits incorporated, and that needs to be in to the publishers very soon. Oh, and I also heard the very first ideas for the Master Box packaging, which should progress soon as well. Personally, I loved what I heard. It's a very sophisticated concept, much more than a cardboard sleeve! In early 2009, I’ll return to NY to continue (and probably conclude) filming. Thank goodness the airlines didn’t lose my luggage since I now have to wear the same brown sweater every time we film so that it can be edited together. It began the morning of Nov 20 as a comfy pullover, and finished the day as a costume! Oh, I almost forgot: We also discussed this past week how exactly to debut all this material next year… a long expected release party as it were. If current plans hold, I defy anyone to surpass what we’ve got in the works! …That reminds me, I have a press release to assemble. A very happy Thanksgiving to all the U.S. readers out there! Due to a schedule chock full of rewrites and holiday responsibilities, the upcoming Book Update is lagging a bit behind, but will be along shortly I promise. As long as I'm chiming in, however, I thought I'd let you know that albums for both Doubt and The Betrayal (Nerakhoon) are officially on the way. Label and date info is still to come, but at least we all have two more things to be thankful for now. Again, all my best to those celebrating this week. Updates will come soon, I promise. 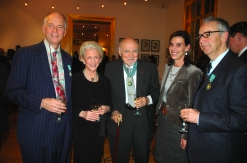 FrenchCulture.org has a nice write-up on last week's Ordre des Arts et des Lettres reception. You'll already know the Shore details, but the co-awardee's biographies are quite interesting. 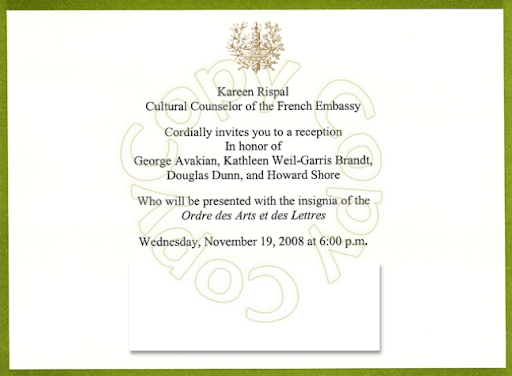 Side note: Dr. Kathleen Weil-Garris Brandt, who was feted that evening, gave a long detailed speech about her passionate quest to prove that the cupid statue in Cultural Embassy's foyer was the work on Michelangelo himself, and not just some anonymous artist. She, of course, made her case, and the little Cupid is now accepted as the master's work. As the event was ending, I stood in front of the statue and locked eyes with the little fellow. Famed dancer/choreographer Douglas Dunn, who also just received the honor, sidled up to me and similarly looked at Cupid. After a few seconds he gently poked me in the ribs, leaned in and jokingly whispered, "I don't know, I still don't think it is..." With a dancer's timing he winked, turned and walked out into the night. Look for a book update coming soon. This past week was huge, and some long-gestating major decisions have finally been made! I'm told we should have definitive word on this issue very shortly. It's been stressed to me that these sets are NOT discontinued at all; the problem should be resolved directly. If you were planning to pick up a box set or two for the holidays, be good for goodness sake: don't turn to price gougers or unsavory sources! Hang in there a little longer. Haven't we done this dance before? I'm beginning to get reports that Amazon is intermittently listing the Complete Recording sets as being "out of stock" or "discontinued." I'm already looking into this and should have details--and hopefully good news--soon. For your enjoyment, a couple of hastily snapped phone pictures from last Wednesday's reception. Click any to see a larger version. Getting Pinned: Shore's honor is bestowed. 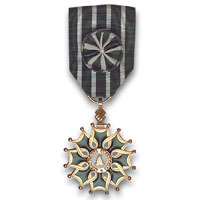 Howard was awarded at the Officier level, the second highest of three potential levels. Via Wikipededia, here's a better look at the ribbon, rosette and medallion. Les Trois: Howard Shore, past Ordre des Arts et des Lettres recipient (and Naked Lunch collaborator) Ornette Coleman, and co-awardee George Avakian. I've been up since 3 a.m. Details (such as they'll be) coming soon. Shanley's "Doubt," starring Meryl Streep, Philip Seymour Hoffman and Amy Adams, is set in a Bronx Catholic school in 1964. "I wanted to capture a feeling of that period," Shore says, "using folk instruments," including hammer dulcimer, recorder, Celtic harp and harmonium. Shore, the "Lord of the Rings" composer who was overseeing the L.A. production of his opera "The Fly" while scoring "Doubt," used only 17 musicians. "It's a really intimate story," he says during a break on the Warner Bros. recording stage. "The dialogue is fantastic, and you want to work carefully with it." And with the principal characters being a nun and a priest, the score often takes on a vaguely liturgical air. "I was trying to create an older, specific sound for the Catholic Church," he explains. There is already considerable organ and choral music in the score (traditional material, not written by Shore), so a cohesive fit was a must. "Organ music is essentially string music," Shore explains, "so I have the strings playing in these long chords. I'm working off the sound of the church. Voices are used, but just for the color, their sound; they're not singing in Latin." Shore -- who last worked with "Doubt" producer Scott Rudin on the Paul Newman film "Nobody's Fool" -- says "there are very strong thematic pieces that connect characters. The music is really used like another means of expression to tell the story. It's a pretty pure way to do it." I'm happy to announce that I'll once again be attending the concerts in Lucerne in 2009. Right now, I can confirm that I'll be present for The Towers Live performances on March 14 and 15. Still working out the details on March 13... due to prior commitments, I may have to miss that one, but I'm still trying to work something out. Just as last time, Howard Shore and I are planning to speak before the concerts. Thanks to the Lucerne staff for their patience while my schedule was assembled. Hope to see many of you there! That's Shore's guestbook signature from last March's visit. Thanks to Sabsi for the picture! Speaking of Lucerne and Rings... stay tuned for announcements coming soon. 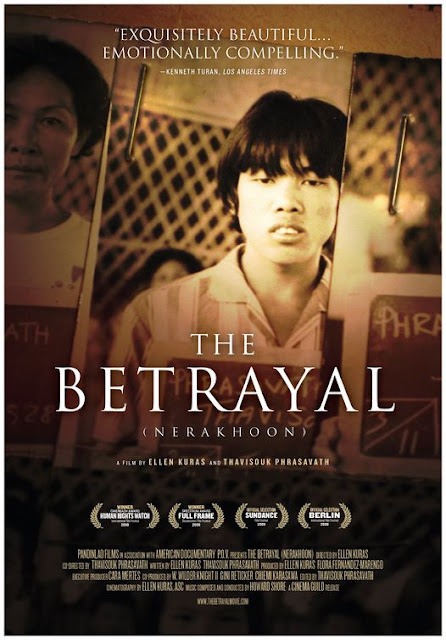 The Betrayal (Nerakhoon) tells the story of Thavisouk Phrasavath and his family's journey from Laos to New York. 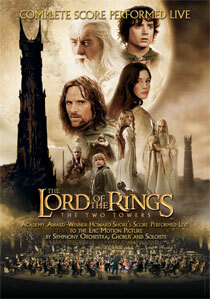 The film is the first pure documentary Howard Shore has scored. The original music primarily features solo cello with a handful of graceful orchestral touches throughout. Posted here is the film's theatrical trailer, in which you can hear some of Shore's music. The film will open November 21 at the IFC Center in New York. Tickets will be available here. As with Fellowship last year, the City Choir of Washington has been tapped to handle choral duties for Wolf Trap's performance of The Two Towers Live. Congratulations one and all! And start your warm-ups now... the Last March of the Ents awaits! Thanks to Lynne Price for the news. 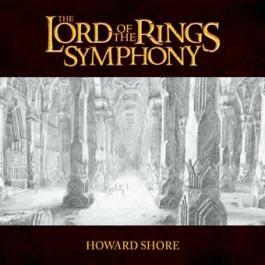 "Howard Shore’s score provides unobtrusive strength." Yes, that's the whole thing. But that's as about as much space Variety ever dedicates to film scores, so it's still nice to hear. Only a few tickets remain for the world premiere of The Two Towers Live in Lucerne, Switzerland. Order yours here before it's too late! It's November now, time for the weather to cool off and the book work to heat up! This month I'll take a final pass at the book's text as I begin to incorporate editorial notes from Howard Shore's office. The notes will come in from New York next week. I'll have a month to get material reconfigured and set for delivery to the publishers December 1. Also this month we'll begin work on the book's DVD content and continuing work on the Rarities Archives. I'll be in New York the week before U.S. Thanksgiving tending to both. So stay tuned throughout November, there's sure to be plenty of news! 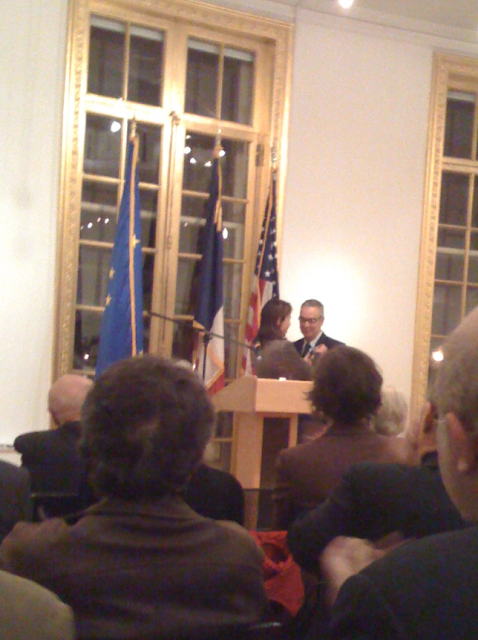 Earnest congratulations to Howard Shore who, on Wednesday, November 19, will receive France's Ordre des Arts et des Lettres at the French Embassy in New York City. As it happily turns out, I'll be working with Shore at his office during this week, and will be able to attend the ceremony. This is, of course, an enormous honor for Maestro Shore. Bravo! Anthony: Some of the work which has begun, I understand Howard Shore is actually already at work on the music - is that correct? Guillermo: Yeah. Yeah. That’s right. Guillermo: … I’m meeting with him tomorrow. Andrew: Oh, OK. And is that you’re first? Guillermo: Ah, no. I met him before. And I’ve admired him for even longer. But, my feeling is one of the most fortunate things that he’s back because if you have to single out the most important pieces of continuing that Universe, he certainly is one. Anthony: Absolutely. So thus far what are your conversations with him like? I mean down to Do you feed him pages? Or are you..
Guillermo: No I think the best way to go about this is to keep the pages to ourselves and just allow people to come from different places – where it be designers, you know. We have conversations – I’ve had a great couple of conversations with John Howe and Alan Lee. And John has been feeding me reactions – reaction sketches to those conversations. And I try not to react to those sketches yet. I try to allow him to feel he’s free to try anything he wants; ‘cause then you are surprised. The same thing is with Howard. I think the parameters are pretty clear. And that is it has to belong to the same Universe, and the music of the three movies – so. By the way, I expect to be in New York in approximately one month to resume Rarities/Multimedia work... and perhaps take an exciting side trip. Details soon. ...and there are still more to come! 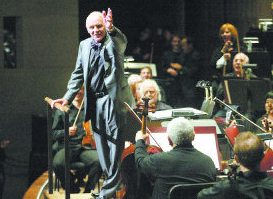 The Star Telegram provides a quick review/overview of last night's DSO concert with Anthony Hopkins. Sounds as if Silence of the Lambs opened the show. Click here to read the full piece. Friends, raise your glasses to wish a very happy birthday to Howard Shore, who was born on October 18, 1946. 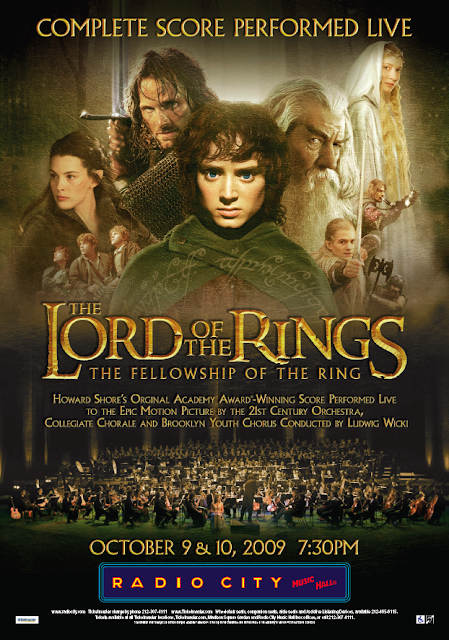 FYI: Tickets for the April, 2009 London Philharmonic performance of The Fellowship of the Ring performed live to picture will go on sale this Friday, October 17 at the LPO's official website. Look lively! Spent an amazing weekend in Boston. If you've not been on the Ongoing Discussion page lately, you may wish to stop by. The book made a sneak preview appearance on the East Coast, and some very kind readers have been generous enough to post their reactions. Click here to see what they had to say. Perhaps they'll even answer a question or two! Thanks so very much to those who spent their time with me this weekend. Your company was treasured! ...and, if all goes according to plan, you will too in a year or so. Read here. Scan for the name Bar Scott. Spend an evening with Anthony Hopkins in the world premiere performance of his original compositions, along with musical highlights and video clips from his illustrious film career, including Silence of the Lambs and Remains of the Day, as well as premieres of his original compositions including August, Slipstream and The Masque of Time, performed live by the Dallas Symphony and introduced by Anthony Hopkins. Sounds like a fun affair! See additional details here. Incidentally, the Dallas Symphony Orchestra has just hired a new president named Doug Adams. It's not me! 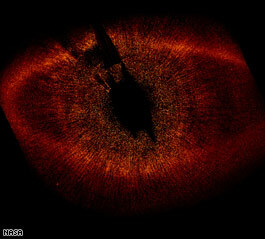 I've just updated the blog's FAQ to keep it up to date with recent developments. If you have a spare moment, please run your eyes over it and see if I'm leaving anything out. I obviously can't hit everything, but I'd like to make sure I've addressed all the big/recurrent questions. The new FAQ is here... or available via the menu buttons at right. Thanks! In the philological spirit of Tolkien, I read with great interest Time's article on words Collins English Dictionary wants to remove from from its listing. Here is the article, and here is the list. ...And yes, one of these words (in a different form) has been used in the revamped Annotated Score! The Riddles Unraveled thread ended up generating more discussion than last month's Ongoing Discussion thread. In order to keep the conversation easily accessible, I'm porting it over here. Immediately below are the last handful of posts from Riddles. New postings will appear below that. 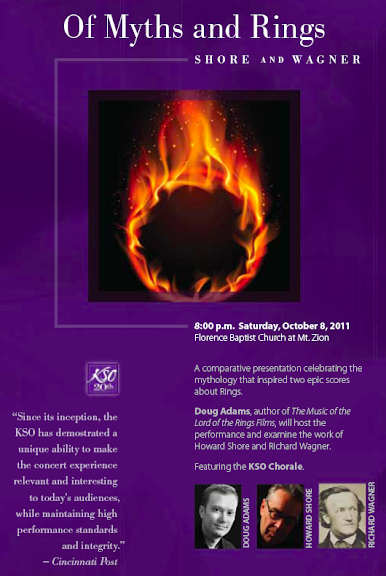 Stop by the Calgary Symphony's website to purchase tickets. The Canadian press is getting in on things too. Read pieces here (Kaitlyn Lusk interview) and here (Doug Adams interview). That's both the original orchestra and original chorus from the film soundtrack. Mark this as developing. I'll let you know more as I hear it. Art Production's site now has tickets on sale for the March, 2009 performances in Lucerne. See here! Markus, one of the blog's regular readers, has thoughtfully nominated us for The BOBs, the worlds largest international weblog awards. He's put a lot of though into the matter, so if you have a moment, please consider checking out his nomination page. And heck, feel free to vote while you're there! I need to do a bit of writing right now--reworking a bit of material at the book's conclusion--but will try to address some of the many questions that have popped up over the weekend later tonight. See you soon! This time Lindsay Warner of The Bulletin provides the impressions. A few weeks back I flipped through the score of Shore's Fanfare, but haven't heard the completed piece. Would love to hear from anyone out there who personally attended. Drop me a line. UPDATE: A third review has surfaced, this one in the New York Times. "The new Fanfare by Shore came out of protracted, intense study of the organ's possibilities: Though Shore is said to have intended an hour's visit to Macy's to hear what he was writing for, he stayed for at least four..."
Remember Fanfare, Shore's new work for organ, brass (4 horns, 3 trumpets, 2 trombones (optional bass trombone) and optional percussion, will receive its world premiere this Saturday in Philadelphia, PA. I'm so proud of my alma mater right now. 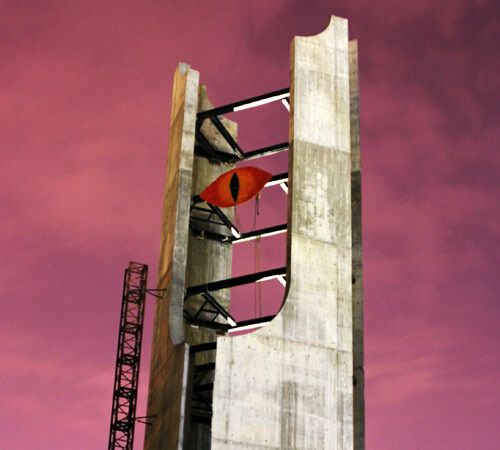 Glad to see that the University of Illinois is still turning out LOTR fans/pranksters. Read here. the couple at the table sat. "i've little patience. less than none ." "i've less," she cried. "a zero sum." the table set, they yearned to dine. and autumn's leaves twice met the ground. now sweetened by their rarity. Tickets will be available beginning September 30 at Art Production's official site. 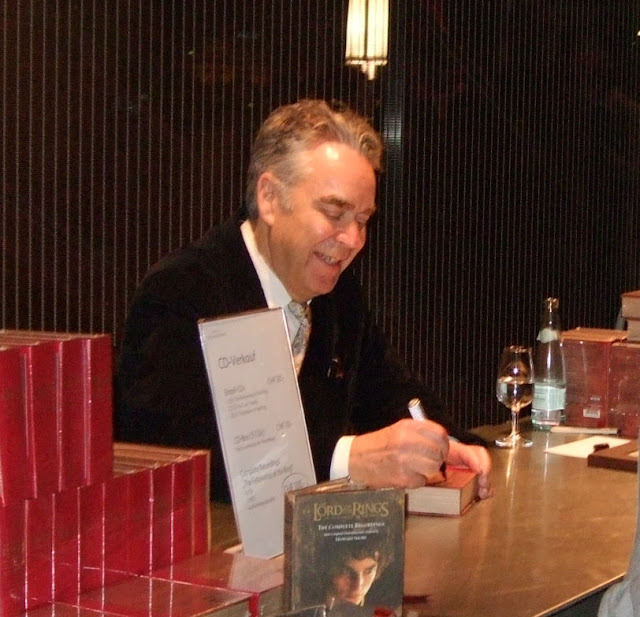 Howard Shore and I both hope to reconvene for pre-concert lectures, if schedules allow. 'twas incomplete, you'd Best Remember. just two-thirds there – a partial view. those two from me chase 2 of U.
Riverfront Timesspeaks with Paul Hahn, who helped prepare the St. Louis Symphony Chorus' pronunciation for this weekend's performance on the LOTR Symphony. What does the ring’s leitmotif sound like? Since 2001 I haven't taken a many leisure-based trips. Generally I go somewhere to get some work done, then see a few sites if time permits. I don't mind that equation at all. After all, it's not as if my "work" is digging ditches. Interspersed here and there was a bit of work related to the book. Shore visited the publisher's offices a few days before I arrived, and of course had been going through the mock-up I sent him a few weeks earlier. He had a few solid suggestions related to one section of the book, which I'm now working on incorporating. But past the nuts and bolts, we also had a few large-scale decisions to make. As I mentioned a little while back, some new opportunities have arisen related to the book. We now have the chance to tie it in to another major release. This has the potential to help us on all fronts: the legal side of things (licensing costs, to be specific), the marketing side… and (most importantly) the creative side. The downside was that we'd have to delay the book's targeted release date in order to allow this "other release" time to assemble. I did some informal polling, both around here and elsewhere, and the vote was unanimous: delays stink… but delays that improve the final product are forgivable. Taking this to heart—as well as the improvements a delay would bring to the book—made the choice pretty clear. As of right now, we're no longer considering November, 2008 as a potential release date. We haven't pinned down a new release date because we're waiting to hear from the "other release." We should know soon. However, what's very important for everyone to understand is that the book is not being shifted around in such a way that it will get lost in the mix. This is a step up with just a tinge of frustration—a tinge due to nothing but impatience. In other words, deluxe just deluxe-er… again… heck, even standard got deluxe-er this time! Once I've made the latest set of revisions (during which I'll probably try and track down a few more interviewees), Shore and I will plan out three or four upcoming four trips to his office. Each of those trips will be filled with a bit of research, a bit of planning, and a bit of filming. We may also do a little filming in Europe. Oh, and if you're still not convinced, let it be noted that you're also likely to get significantly more unused music in your hands this way. Yes, I said "significantly." I hope the above doesn't strike anyone as Pollyanna prose. I'm genuinely excited by these new possibilities… well, honestly the filming thing terrifies me ever so slightly, but I'll manage to screw my courage to the sticking place, I'm sure. I'm also ready to take a few knocks from people who have had their Christmas lists tossed into disarray by this announcement. It wasn't an easy choice to make. And I feel a bit of that frustration as well. I've been hammering away at this book since 2002. I used to gasp in amazement when I heard how long the Jacksons spent in Middle-earth in order to bring The Lord of the Rings to the screen. Now I grin in empathy. I'm about to push year six into year seven. And yes, I'll be hopping right on to The Hobbit. I'll easily spend over a decade in Middle-earth. But the point is: I want to show off what we've created! I'm impatient too! But I feel confident that this choice will make the Big Reveal even more momentous. I'm incredibly proud of this project, and it's only getting better! Please, if you have any questions at all, post them here. I was contacted by Andrew King who said he could provide me with a little information about some of the Hardanger fiddles involved with the LOTR score that his father had made. I was interested and he said he'd get back to me in a week. Well that turned into a few months as he tried to do some fact checking among those involved. Finally, a few weeks ago he got back to me with a short article. The use of the Hardanger fiddle in parts of the LOTR score sparked a lot of interest in this Norwegian folk-version of the violin, with its unplayed 'sympathetic' strings under the fingerboard adding a ghostly resonance to the sound, and its characteristic patterned decoration. If you were to encounter two of the Hardangers involved in the recordings however, you might be surprised. Neither was made in Norway, or by a Norwegian maker, nor are they decorated in the traditional style. Both were in fact made by my father, Mr J E King, an English luthier. Now retired, but still making, Mr King has produced a wide variety of stringed instruments for classical, folk and early music players, all with his own distinctive sense of design. An instrument-maker with an engineering background, he has an intuitive sense of the mechanics of sound-production, ensuring that his instruments have strong and distinctive 'voices'. But, methinks I risk protesting too much. The Fly speaks for itself. It doesn’t need me to defend it… though I can certainly tell you what I liked. Tonal consistency has always been a hallmark of Shore and Cronenberg’s work together. Once they establish the tone of a piece, everything grows out of that tone. The humor, the horror, the joy, the pathos. This opera is no different. Shore’s harmonic language is very specific and very controlled in the work. It’s also very mature… consistently chromatic, very stepwise, rhythmically fluid, through-composed. It maintains this sound through all moods, though the orchestra forever paints it differently, sometimes embracing the winding vocal lines with warm triadic harmonies, sometimes battling the melodic fragments with cackling brass outbursts, sometimes complicating textures with counterlines, sometimes building dread with heart-beat cluster chords. There’s some wonderfully evocative text painting going on if one listens to the voices as contextualized by the orchestra. Shore has always treated the voice as an extension of his instrumental palette. Though the voices are out front here, this is no different. 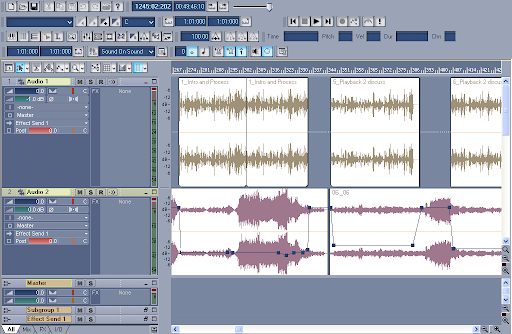 The static choral writing for the computer’s “voice” is particularly effective in this regard as it weaves its way through the writing to create a depth of texture… and yes, build even more dread. The Fly has no intention of sensationalizing its subject matter. That’s not to say that sensationalistic treatment of lurid material discredits an opera. Look at Wozzeck! But Shore is not interested in replicating the ooky spooky aspects of the story. 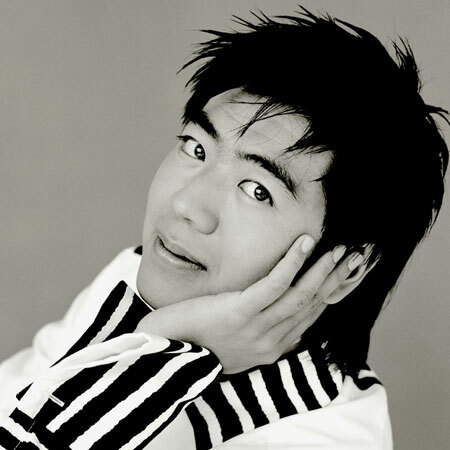 His score deals with greater themes. David Henry Hwang’s libretto demands no less. The Fly has always been used as a vehicle for deeper subjects. Even the 1958 Vincent Price played into the scientific paranoia of the early nuclear age. In the 1980s Brundle’s transformation was a metaphor for disease and the breakdown of the body. In the opera, Brundle is drawn between his mind and his flesh in a bid to better understand his own nature. Which is the true Brundle? There are also ruminations on the conjoined natures of life and death… birth being the first act of dying, death being the first act of a new state of existence. Twice the phrase “dying to be born” appears. But Brundle’s experiment only draws these questions into sharper focus. He never gets any closer to answering them. Shore’s is the music of these questions. It is not based on prominent recurring motifs or momentary retreats into the safety of familiar harmonic progressions. It searches and searches. Had the music offered any sanctuary, it would have been dishonest. That’s not what this is about. A beautiful tonal aria in the midst of all these unanswered questions would have dishonored the opera’s characters and intent. The Fly is unforgivingly intelligent. It considers its own integrity as a piece of drama and music before it considers the audience’s comfort. In its refusal to pander it, it creates something so cerebral that it evokes an emotional response… even if that emotion is disquieting horror. Brundle’s tragedy is our own: an awareness of questions too big to answer. I don’t know that we feel bad for him in the end. Hubris guided his hand. But thanks to Shore’s challengingly effective writing, we can empathize. That’s exactly what art should do. The spiffy new header frowns at me every time post something non-LOTR related, but this is too good to pass up: Howard Shore is officially composing a concerto for piano and orchestra at he behest of world-renowned Chinese pianist Lang Lang. Expect to hear more in the coming months. This work will mark Shore's first effort in the world of instrumental concerti. Very exciting! Playback:stl has got the scoop! I've had limited Internet contact this weekend (I'm posting this on my phone), but will have a full LA report for you shortly. On my way to the airport now. See you soon! I'm Los Angeles-bound tomorrow evening. The next couple of days should be filled with CD reviewing, book editing... and apparently a bit of filming! I'll explain once things get rolling out there. I'm just now learning details myself! If anyone is planning to be the at The Fly Saturday night, please come say hello! Ok, then. Bags are packed... eyes are ready to close. See you on the left coast! 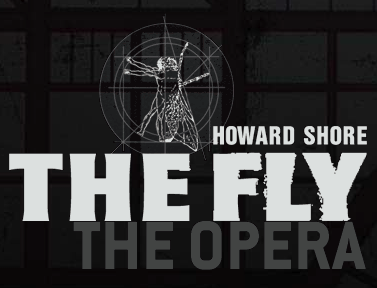 The LA Opera has posted a podcast including a lengthy interview with Howard Shore discussing his work on The Fly. It's a lovely, in-depth piece... definitely worth your 8 minutes! How did it get to be September already? With time flying so fleetly, I'm not even sure when the last book update was. Nevertheless, here's the next one… let's just assume that I've kept them at evenly spaced monthly intervals… even if for no other reason than to assuage my guilt! Much has happened since the text was locked way back whenever. We've now entered that zone where almost everything happens on paper, or as phone calls, or meetings, or lunches. This the business end where things seem creatively static, yet the real meat of the project is established. Not everything is pure business, however. Design elements continue to come in. You've probably noticed the blog header has been changing a lot recently. This relates to ongoing work on the book cover…. the standard edition cover, that is. When the cover is fully locked, I’ll plan to debut it here. Inside the book, I am now in the process of vetting about two-dozen new music examples that never appeared in the liners. Some relate to themes that weren't discussed before, some will be placed through the Annotated Score so that ALL sections of the book combine words and notated music. Sue Sinclair, who engraved the music examples for the liners and created the short score compressions, has put together wonderfully detailed examples of passages throughout the scores. Those of you who like to sit and pick out notes of the piano should be thrilled! And even if you don't read music, these examples bring a wonderful graphical element to the book. We're also hoping to include some of Shore's pencil sketches and conductor's scores from the sessions, complete with live-from-the-podium pencil scrawling. So if you're a behind-the-scenes aficionado, we should have something for you too. And of course, this is all in addition to nearly one hundred thousand words… so I think we can comfortably assert that the word "Comprehensive" has earned its spot on the cover. Next weekend I'm headed out to LA to work with Shore – and of course, to enjoy The Fly – so perhaps I'll be able to have another significant book update for you soon. Two updates in under a month! I'm on a roll! Enjoy the new discussion board below. Talk soon!